1. 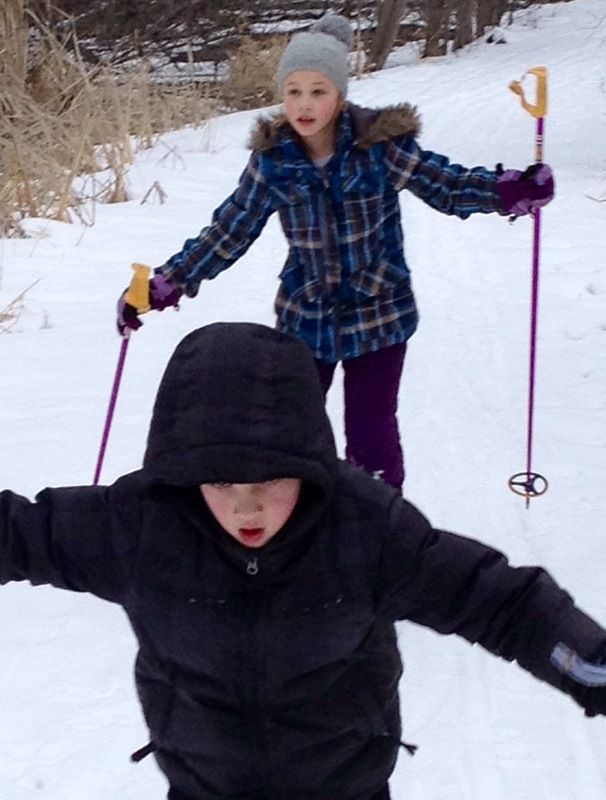 Hey, we’re Norwegian, shouldn’t cross-country skiing come natural to us? 2. Don’t we live in a climate ideal for outdoor activities, especially in February/ March? 3. Is it not safer than downhill skiing? 4. Are we not going stir crazy inside with no hope of winter vacation release? A few Sunday’s ago we answered yes to all of our questions. 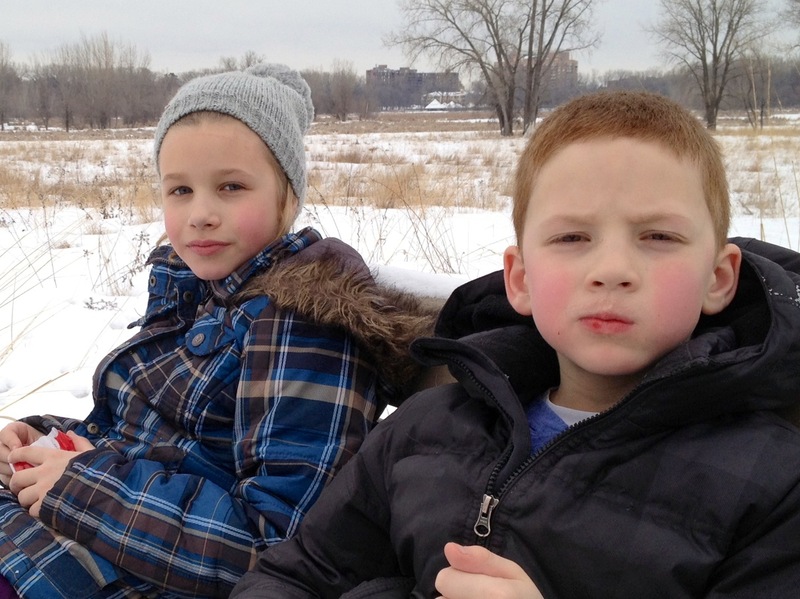 We considered heading to more serious trails – either Hyland Park Reserve in Bloomington or Highland Park in St. Paul – but landed on Wood Lake due to its simplicity, our novice skills and its proximity to our home. 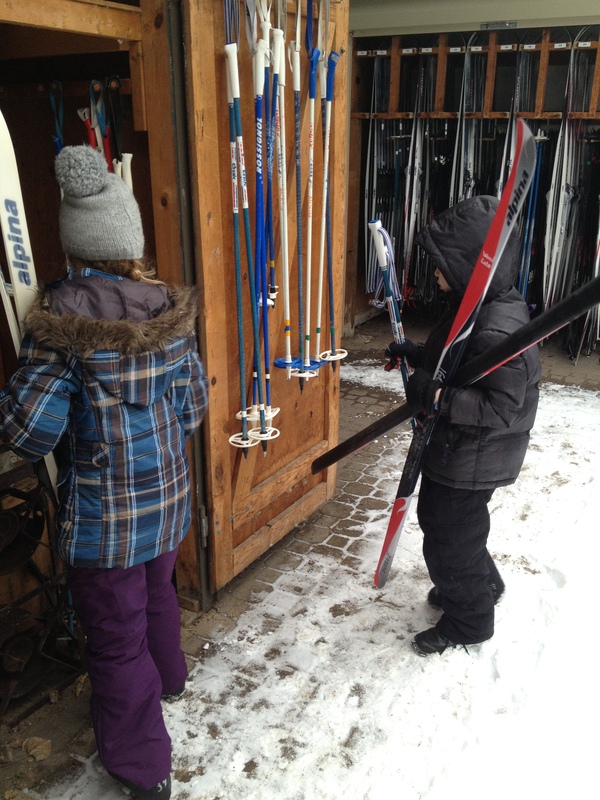 We measure for boots, select our sizes and head out to the skis and ski pole racks. We have some loose guidelines – skis should come to mid-palm when you’ve got your arm reaching for the sky. It’s lucky we don’t take someone out getting from equipment rentals to the trail’s start. Next time, I’ll give a lesson in transporting your gear. We spend some time hooking our boots into the skis. A group of three girls from my 9-year-old daughter’s school plus one mom are there for the first time too. Good, we can all look like newborn calves together. At least we’re a one parent to one kid ratio. 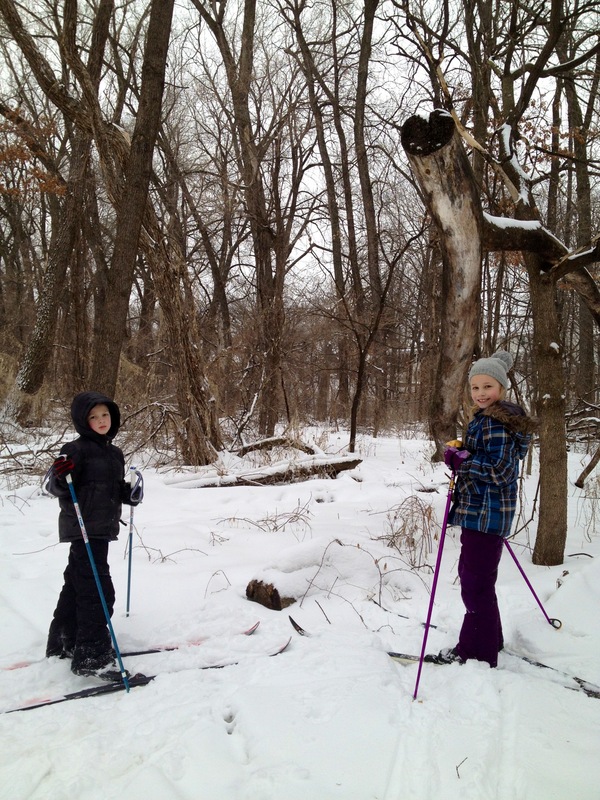 We start off with two of the girls from Ava’s school intermingled with our skis. Quickly we come to a fork in the road. We need to choose the long route (2.6km or 1.6 miles) or the short route (.6km). I can’t imagine how it would be worth it to get all geared up just to do the short route. We veer left. My 7 year-old son, Calvin, scrappy as ever, insists on being in the lead. Ava on the other hand, has a nice stride going and actually looks up once in a while to feel the sunshine and take in some nature. The paths are easy to navigate and well-groomed. It’s no problem to pass. At this point, just under a mile in, I notice the Mom and other child in the foursome are not to be seen. Loosely, it’s the six of us now, making our way around the marshy frozen lake. There are plenty of rosy cheeks, complaints for water (which we did not think to bring) and tired little legs. We stop for a break at the half-way mark. Then it’s time to complete the circle. We all fall a few times. Sometimes when we’re just standing in place. The finale is the steepest hill of the course where you have to point your skis outward and inch up the hill. The downward coast after is well worth it. We reach the end, unhook our boots and carry in our gear. From start to finish = 1 hour and 25 minutes. We agree we’ll have to trek around again very soon and try to improve our time. Then we decide it would be fitting to head to Pizza Luce for slices and a brownie sundae. All that hard work deserves reward! A few notes: I learned a few days later that the mom as part of the foursome overseeing the three girls, was a bit concerned. The two girls intermixed with us were supposed to take the .6km short route and instead took the long route. Having taken the short route, she was a bit panicked until she met up with the two older girls. I’m also happy to say that within 1.5 weeks of the first outing, we made it out for a second spin. This time with water and snacks. We discovered more in the woods (due to comfort with our strides and a finer attention to nature’s detail). For example, we came across a tree sculpture that we adequately named Wishbone.